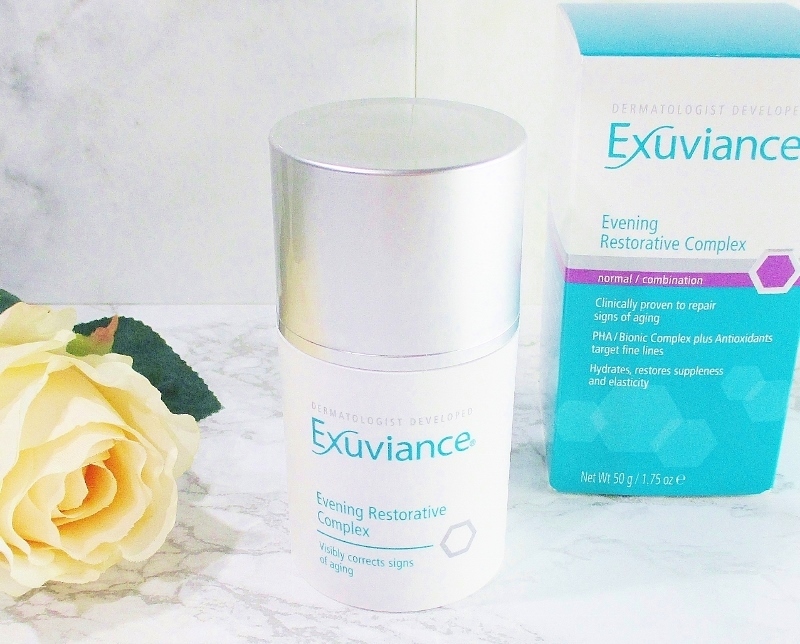 I recently got the opportunity to try the Evening Restorative Complex from one of my all time favorite skin care brands, Exuviance. I appreciate their science and results based formulations and sleek, elegant packaging and the fact that their skin care just works for me. I am always happy to add another of their fantastic products to my skin care arsenal. 87% of users felt softer, more supple skin after 4 weeks of using this high performance, anti aging night cream with Polyhydroxy Acids and botanicals. 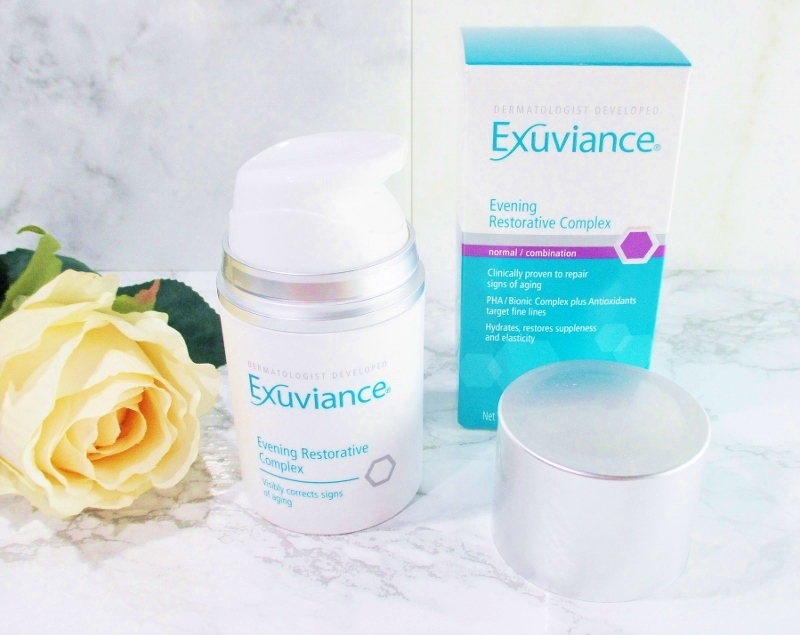 Exuviance Evening Restorative Complex is a pale blue, medium weight, silky cream packaged in a light and air safe plastic jar with a vacuum pump to assure hygienic delivery and that the active ingredients remain potent and effective. I was a little skeptical that this cream would be heavy duty enough for my very dry skin but I needn't have worried. This lovely cream spreads smoothly across my skin and drops in, leaving it feeling soft and hydrated all night long. Score! Sensitive beauties, this night cream has a soft, fresh scent that can linger for a while. If you have ever used the Exuviance Bionic Oxygen Facial, (a product I highly recommend!) it smells a lot like that. The scent does start to dissipate after a few minutes and I don't mind it but if scent is a no go for you, this cream will probably not be right for you. If you would like to experience this beautiful anti aging night cream, for yourself you can shop from Exuviance and you can find it at Ulta Beauty. Grab a bottle of this night cream, apply it, #sleeponit and see if your skin doesn't look and feel softer, smoother and a little firmer when you wake up. This cream sounds so nice! I may need to try this when my current nighttime moisturizer runs out!!! I need to wake up to younger looking skin... no doubt. This year in particular the winter has been HAVOC for me. This sounds like something my skin would love! When I finish testing my current brand, I'll try this. I've had good luck with this brand but haven't tried anything for a while. Thanks for the warning about the fragrance. While cleaning I found an Exuviance set that I've had for a while and will try the products to see if I can use them. I know it's an outstanding line.